Video is rapidly becoming a marketing channel every small business should embrace. It is a rising star in terms of its place in marketing plans of many companies and will continue to grow in importance. According to Cisco traffic coming from video streaming will be 82% of all Internet traffic by year 2020. That is 70% more than in year 2015. YouTube not only is the second most popular website in internet according to Alexa, but also boasts over 1000 000 000 000 (or one trillion) unique visits every single month. Video is a medium that engages the viewer immediately. It easily conveys message in a way that is often more memorable than a written text. Video appeals to a lot more senses simultaneously than simply reading. Sound and vision, text and special effects are all part of how video engages with viewers. 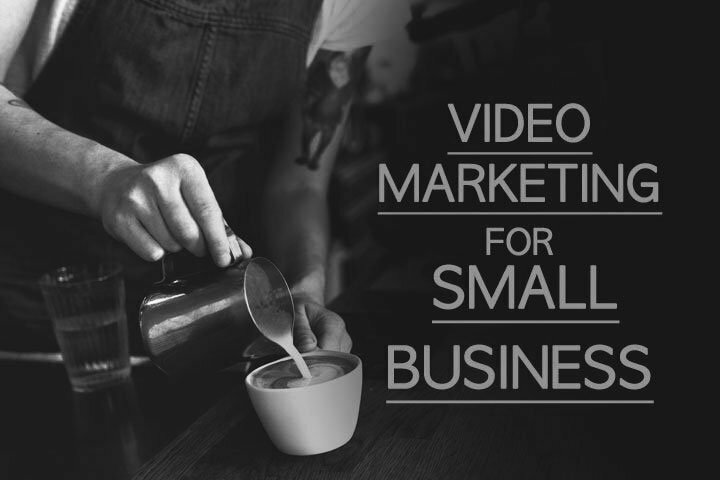 Starting video marketing for small business can seriously boost conversions. According to EyeView Digital putting video in a landing page (main sales page) increases conversion by 80% (conversion is a desired action you want your website visitors to make). Similar data is reported by Unbounce who claim that putting video into your website increases conversion rate by 100%. Furthermore, some case studies show that sales can be increased by up to 216% after adding introductory video (reported by Visual Website Optimiser). Similarly in another study it is concluded that visitors who watched a video had a 43% higher conversion rate than those who didn’t ( Internet Retailer). All this data shows that video is a very important tool that must be used to boost your business. Trust is fundamental to any small business. The way to build trust is to stop selling aggressively and start giving customers useful information that will make them come to your business naturally. Video feels personal and allows the customer to see you, your team, your premises, your product as if in person. Video marketing for small business creates trust that is hard to achieve by any other means. It is not easy to fully imagine how good a product is if all you have to judge from is a couple of photos. Video can provide a real insight into the product you are selling. Not only will product demonstration video or explainer video save you a lot of unnecessary customer service questions, it will also boost sales. According to Internet Retailer those website visitors who watched a product demo video were 114% more likely to buy a product than those who did not. Another researcher E-Tailing states that 44% of website visitors agreed that they are more likely to buy after watching a related product demonstration video. If you are selling products, don’t hesitate to invest in product demo videos – it will surely give you high returns. And even if you don’t have budget for professional product demo video production, you can still do it. Do it yourself. Here is a handy video CineEye produced for Getshop Today on how to create product demo videos with just a smartphone and a couple of accessories. The increased popularity of video is also partly due to popularity of social media platforms. These platforms are getting increasingly optimised for easy video uploading, streaming and sharing. Facebook has recently launched 360 video, Live video and Lifestage app. Instagram has introduced 60-second video and Instagram stories as well as IG TV. According to Twitter, videos and photos get the most re-tweets. Create entertaining and creative videos and you will see more social shares and as a result – more traffic to your website. Although video is the rising star of marketing, it must be said that the online world is already oversaturated with a variety of content. If you want to achieve real results with your video marketing for small business you have to stand out. Be professional, creative and authentic. Good quality, interesting and personal videos will always produce great results. Therefore don’t hesitate to hire a professional video production company to produce your videos. While I agree that video marketing is the next big thing for any marketers, with the fact that the internet is already saturated with countless videos being published daily, it is crucial to also incorporate social media marketing to further enhance the efficiency of video marketing. In recent years, video marketing is very important to increase anyone’s online visibility. It is the perfect way to warm up leads because people get to know your face, hear your voice and expertise on display. Thanks for sharing your thoughts on video marketing. I completely agree that video marketing is becoming more and more important and effective as a tool to promote one’s services and products. Most small business owners focus on similar business goals. If their business goals include brand recognition, better customer service and loyalty, then video marketing can help them a lot.